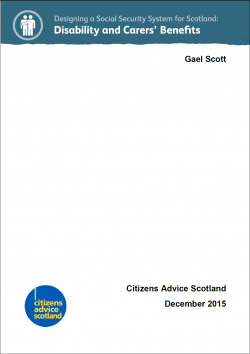 To inform the development of a distinct Scottish approach to disability and carers’ benefits, Citizens Advice Scotland gathered views from bureau advisers and clients across Scotland on how they would want the new powers to be used when they are devolved to the Scottish Parliament. This report outlines CAS's research findings and a number of recommendations for how the Scottish Government should use its new powers. Our research included focus groups and interviews as well as an online adviser survey. Overall, most participants did not think that, when the relevant powers are devolved to the Scottish Parliament, there should be a complete overhaul of the current system. However, there was clear dissatisfaction with a number of aspects of the current system, particularly the way in which Personal Independence Payment (PIP) has been implemented.